Trimming is a key to a good brisket. If you don’t know how, there are many video’s on YouTube to show you how to do it. If you inject your brisket, start by injecting every square inch trying not to puncture the back side. There are plenty of great injection products on the market to try. If you don’t inject, skip to step 4. Wrap tightly in plastic wrap and place in a cooler with ice for 2-3 hours. Remove from cooler about one hour before smoking so the meat reaches room temperature. Unwrap and place on table. 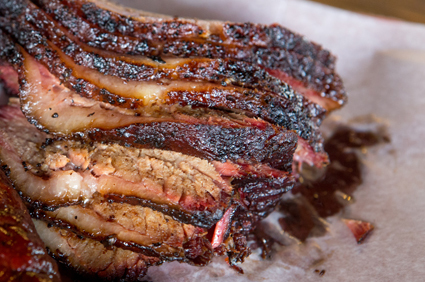 Apply a thin coat of Yellow Mustard to all parts of the brisket. 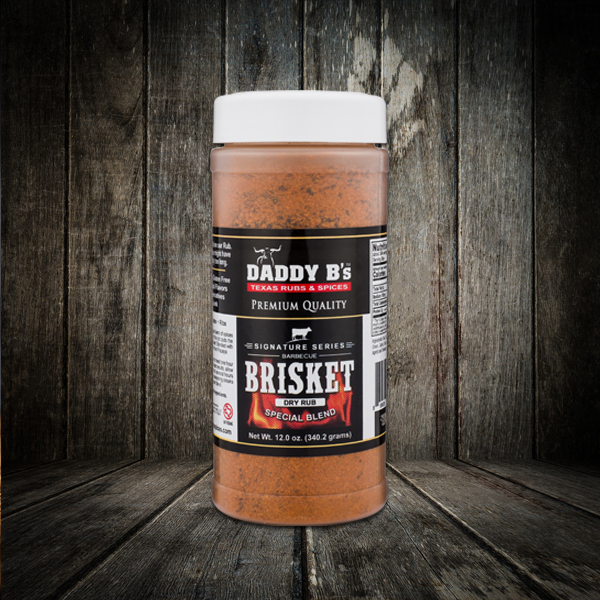 Then, apply a liberal coat of Daddy B’s Brisket Rub to all sides of the meat and lightly cover with foil to marinate. Heat smoker to 250o (should take close to an hour to heat and stabilize). Place brisket fat side down on upper grate with the point facing the heat source, if able, place a thin basting pan underneath with a little water in it on a lower level to catch the juices which will be used later. Plus, a little water will help keep moisture in the pit. After about 5 hours, check the brisket for color. If you want it darker, keep cooking, if it looks right, pull off the smoker and wrap in red butcher paper, or foil and put it back in the smoker. When the internal temperature of the flat reaches 200o it’s done (could take 4-5 hours). Place wrapped brisket in a pan and place in a empty cooler with several towels on top. Rest for at least 1 hour, but recommend at least 2. About 30 minutes before slicing, remove from cooler and allow to rest by venting and/or removing the foil. For extra flavor, after slicing, dredge each piece through the pan of strained juices.